Since the company was founded in 2005, Migris has worked on the development of a new tool to analyze exploration and drilling risk in petroleum system. Our clients are oil companies that want to reduce risk before drilling or constrain exploration risk in drill-drop decisions. Our initial development phase resulted in an interactive 3D oil and gas migration simulator being released for use in 2009, just as we started working with Tullow Oil. “If I could only buy one software package today, it would be Migri. We have many more complex and expensive tools, but I do not always see the necessity for having them,” says Angard. The technology has been applied since 2009 to multi- and single-client studies for Tullow Oil, as well as clients such as Statoil, Eni and ConocoPhilips. “When we are short of time – as is often the case in prospect evaluation – Migri is fast. And we can buy in consultancy help from Migris at short notice,” adds Angard. Angard has used the simulator, studies and consultancy services, and believes that the biggest and most noticeable development has been the simulator’s stability. “Migri can now handle large-scale models, a lot of data at one time and has excellent detailed resolution. Stability is vital to me, and I quickly lose patience with anything that doesn’t work,” he states. 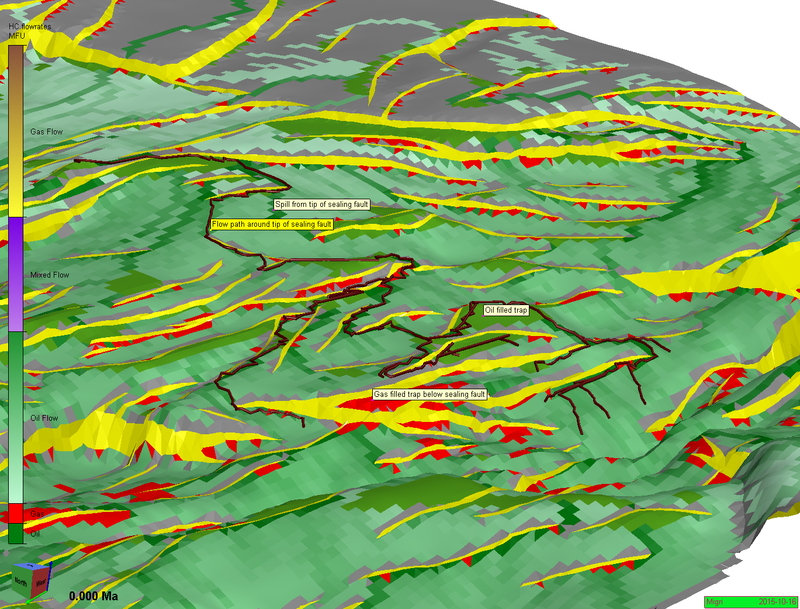 This 3D Visualization, which you can view in Migrino, shows hydrocarbon migration around a number of sealing faults and highlights some of the flowpaths. Download our free 3D viewer Migrino here. The simulator proved itself very stable this year in a number of large Monte Carlo simulation cases. We used our iterative Monte Carlo simulation techniques to calibrate the model – and the efficiency of calibrating complex 3D petroleum systems has increased dramatically. The many alternative models that fit the observation points (typically oil and gas column heights in drilled exploration wells), can be used to estimate the uncertainties in oil column or volume predictions (see Figure). Our new flow risk and phase risk plots are compiled from the Monte Carlo-generated flow rate maps, giving fast and accurate estimates of charge risks for prospects. This HC flowrate map shows complex migration around partly sealing faults (yellow) with trapped gas red) and oil (green). The black lines highlight some of the modelled flow paths. Notice how the flow paths go around the tips of sealing faults, resulting in a complex pathway. The MigriComplex project will extend this complexity to include cross-fault and up-fault migration into older and/or younger layers. Migris anticipates further growth over the next five years. The technology is adapted for both quick-look exploration analysis, when full 3D charge analysis must be completed in days, and advanced studies where the full charge system of whole basins is undertaken. Key to success will be the system’s ability to quickly run multiple alternatives and investigate resulting uncertainties for the charge system. Some of the most common geological systems that have been studied with Migri over the last 2-3 years include local sands (pinch-out traps) and fault seal trapping. We anticipate these types of exploration models to be even more important in the future. The Migri technology is now a stable technology in production use. But development continues and as part of our innovation efforts, the first meeting in a new 3-year technology development project was held in September 2015. “We are going to continue working with Migris, including the MigriComplex JIP project, working on complex geometries and projections. We have stated that this is an area we felt could be improved for years – and believe that Migris have listened to us,” says Angard. 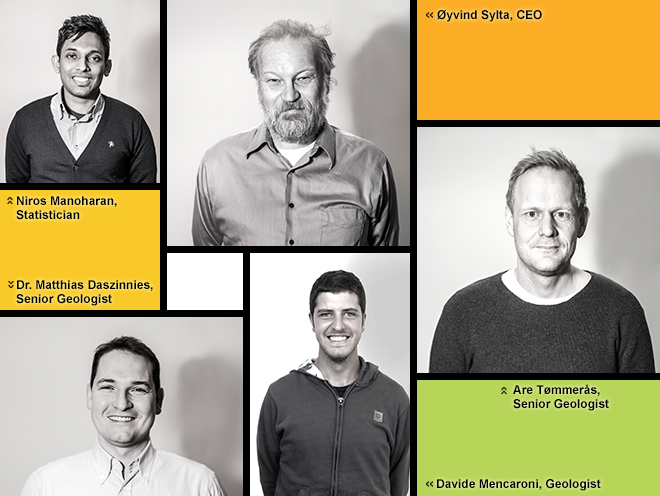 The MigriComplex JIP is supported by ENI, Statoil and Tullow and aims to improve modeling of the hydrocarbon migration system within complex fault systems, with flow across and up along fault surfaces. A high-resolution primary migration model is also being developed. The primary migration technology is needed for conventional and unconventional exploitation. The third and very important topic is aimed at improving uncertainty analysis.